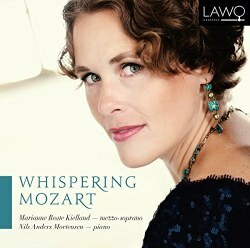 On a personal introduction to this recording, published on LAWO’s website, mezzo Marianne Beate Kielland says and I quote: “To do the songs of Mozart is indeed something of a challenge, precisely because they are so simple. Excessive pathos or outpouring of feeling is unsuitable. Emotion is to be expressed, of course, but it must be confined to the delicate and simpler limits that Mozart has established. I have chosen, therefore, to call the album ‘Whispering Mozart’, for that is how it feels to sing this material: as though you are whispering the words and melodies to the few who have gathered in your living room to listen …” I chose to start my review with Ms Kielland’s words because they are exactly what I felt the first time I listened to this captivating CD. Mozart’s music output was extraordinary for a man who lived such a short life. Most people will probably know some of Mozart’s greatest works as for example his operas, especially the ones he composed for the words of Lorenzo da Ponte, some of the concertos and the symphonies. Some people may even hum Mozart’s melodies at times without knowing what they are but how many people know that Mozart also wrote more than thirty songs and that he was a pioneer of the song as an art form? As Ms Kielland also quite rightly states: “It was he [Mozart] who elevated the song from domestic and traditional music to the realm of serious music.” With this recording I believe that she and Nils Anders Mortensen at the piano are trying to demonstrate the artistry and variety of Mozart’s songs as well as bringing a recording of Mozart’s works that are generally little known. Kielland’s and Mortensen’s recital is not the first CD of Mozart’s songs. I can remember well a delightful recording of Mozart’s complete songs from Naxos in 2008, with soprano Ruth Ziesak, tenor Lothar Odinius and pianist Ulrich Eisenlohr, which was reviewed by MusicWeb contributor Göran Forsling and myself. In that same year there was also another equally lovely recording of Mozart’s songs from Cypres with soprano Sophie Karthäuser, baritone Stephan Loges and pianist Eugene Asti. But Kielland’s and Mortensen’s offer is different from the previous two though dealing with the same repertoire. For one thing they don’t cover the complete songs but a selection of those in German – 21 in total. Then, Norwegian mezzo Marianne Beate Kielland sings all the songs rather than also having a male singer as is the case in the other two recordings from 2008. To me the most important difference is the approach that Kielland and Mortensen decided to take. They prepared and delivered the recital as it if was a house concert at a social gathering in the home of a prominent politician or an aristocratic, wealthy family, patrons of the arts. It reminded me of a CD from Gramola by the Calamus Consort that I recently received. In it the ensemble successfully attempted to recreate an evening of music at the Jacquin residence, a distinguished scientist of the time whose children were Mozart’s personal friends. Just like this CD, Kielland’s and Mortensen’s performance of Mozart’s songs has an intimate feeling to it, a subtlety and simplicity that make the recording very attractive, perfectly fitting the idea of a house concert and the title of the album Whispering Mozart. With this interpretation of Mozart’s songs Kielland and Mortensen continue their excellent and extensive music collaboration. They have given us a variety of outstanding recitals – the pinnacle to my mind being Grieg’s three major song cycles – and follow their own established tradition with this work. Whispering Mozart does not offer any new pieces or unknown works by the composer but what it does is give one a fresh reading of some of the best of the composer’s songs and a performance of great quality. Marianne Beate Kielland has a wonderful voice, irresistibly warm and one that can insinuate itself and get under one’s skin. Her tone is crystalline and pure and her diction very near perfection. I think Mozart would probably have loved listening to her singing his songs. Her interpretation is beautiful throughout, restrained and subtle, harmonious and really in a word – classical. She is cheerful in Das Traumbild and the famous Sehnsucht nach der Frühling and suitably sad in Das Lied der Trennung, singing it almost as a lament, which in essence it is. Other highlights are An Chloë sung with great feeling but never becoming sentimental, the delightful little Cantata Eine Kleine Deutsche Kantate often referred to by the first verse of the initial recitative Die ihr des unermeßlichen Weltalls Schöpfer ehrt and my personal favourite Das Veilchen, the only song composed to a poem by Goethe. Das Veilchen (The Violet) demonstrates rather well Mozart’s attention to text. The poem is very beautiful but full of tragic irony and deceptively simple in the story of the little violet. Mozart displays in his writing of this song subtle changes of inflection and vocal line to express the tragic irony of the text, creating a little drama exquisitely sung by Kielland, charmingly accompanied on the piano by Nils Anders Mortensen, as indeed throughout the recording. The disc comes with a booklet with rather interesting notes that include an amusing anecdote about Mozart and one of his songs, making for pleasant reading. It contains the texts to all the songs in the German original with very good English translations and includes biographies of the two artists in Norwegian and English. The songs I’ve listed in one of the above paragraphs are my personal highlights but this whole recording could be described as a highlight from beginning to end. It is well worth having even if you already own another recording of Mozart’s songs not only for Kielland’s excellent alluring and compelling singing but also for Mortensen’s performance at the piano. He is never intrusive and perhaps because they have worked together many times before there is a perceptible rapport and an elegant, appealing dialogue between the voice and the piano. Whispering Mozart is a truly wonderful work and I have no doubt it will pleasingly ‘whisper’ in your ear for many hours to come.